Some human parents are simply amazing and wonderful although there are also some ridiculous and terrible parents. The same are true with animals; some animal parents are fantastic while others are incredibly weird. Here are some of the weirdest parenting behaviors in the animal kingdom. Catfish steals and eats cichlid eggs and swaps them with their own so the cichlids end up hatching the catfishes' eggs. During incubation period, the mother Hornbill is tucked inside the sealed nursery with her chick for 4 months. Slavery also exists in the animal kingdom. Amazon Ants or Polyergus breviceps steal Formica Ant eggs, raised them and use them as slaves. Emperor Penguins are the largest species of penguins. Mothers Emperor Penguin whose chicks die steals other mother's chicks. 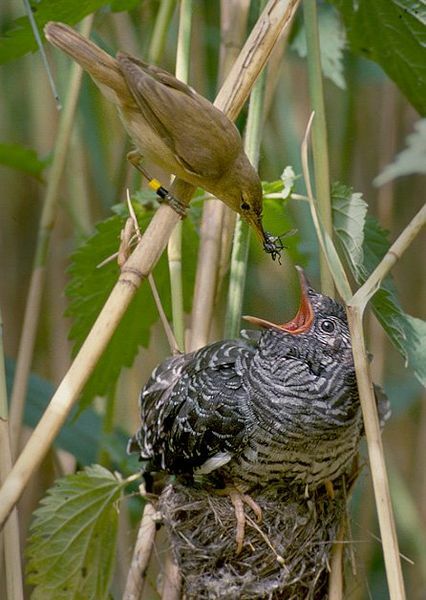 The female Cuckoo Bird lays her egg in Red Warbler’s nest, so the mother Reed Warbler takes care of a chick ten times as heavy as she is. Seahorses are among the weirdest animals in the world. It’s the male Seahorse who gets pregnant and gives birth to the young. Male Giant Water Bug carries 700 young on its back. Darwin’s Frogs put their young or tadpoles in their mouth to protect them from predators. These tadpoles are raised inside the vocal sac of the males. Surinam Toads are amazing amphibian parents. They can carry 100 young on their back. The eggs are embedded in the frog’s skin.